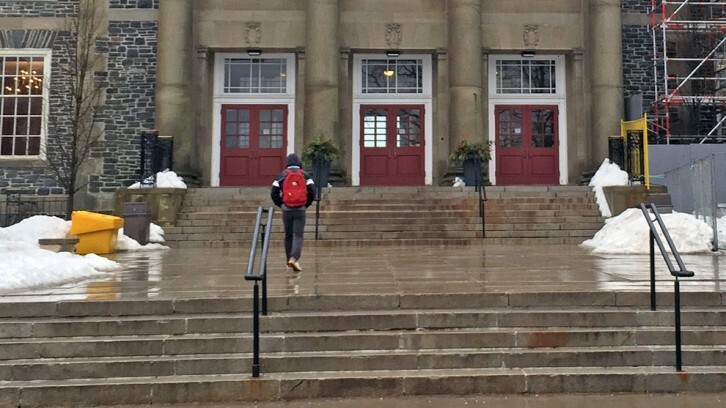 Though it’s possible more American students will be looking toward Nova Scotia for university in wake of the tumbling loonie, post-secondary institutions in the province say they don’t have the brand power to quickly capitalize this year. That doesn’t mean schools won’t be advertising. EduNova is a co-operative association funded by educational institutions that specializes in recruiting international students. The registrar at McGill University told the Globe and Mail in January the school had experienced a 13 per cent increase in applications from prospective American students. She attributed increase to the favourable exchange rate. The registrar at the University of Toronto said the institution typically receives an increase in applications when the dollar is low. But so far Dalhousie University and Saint Mary’s University have yet to see similar increases, representatives said. Luther thinks this is due to brand power. The size and marketing strength of large institutions such as U. of T., UBC, and McGill likely translate into stronger brand reputation. U. of T., for example, had 84,556 students enrolled last fall, almost double the total Maritime student population, according to the Maritime Provinces Higher Education Commission. In-state tuition at the University of New Hampshire, an institution similar to Dalhousie in terms of student population and course offerings, was US$27,604 this year—including room and board. At Dal, full-time arts tuition for international students with residence and a meal plan was US$19,624.70 on Feb. 3. An out-of-state student at UNH pays just under US$41,000. According to Luther, international education is a $2-trillion a year industry globally — one Nova Scotia could be a big part of. 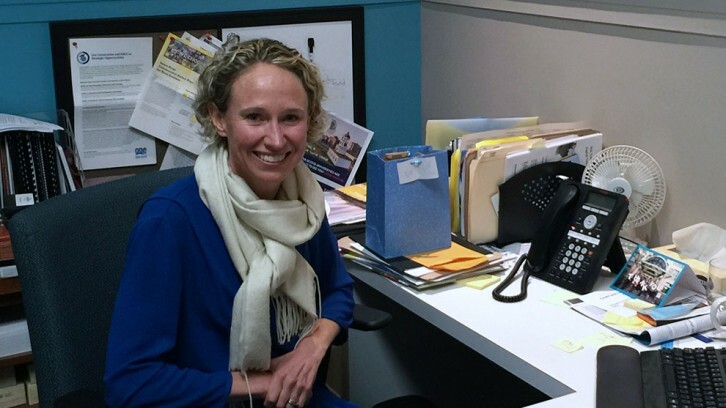 However, she suggests that marketing is crucial. “You could be free, and if someone doesn’t know you exist or doesn’t see you as a legitimate post secondary option, then they’re not going to cross a border and get a study permit to come here,” she said. On an individual level, the region’s universities can’t compete with Canada’s big three schools in terms of marketing. EduNova provides strength in numbers. 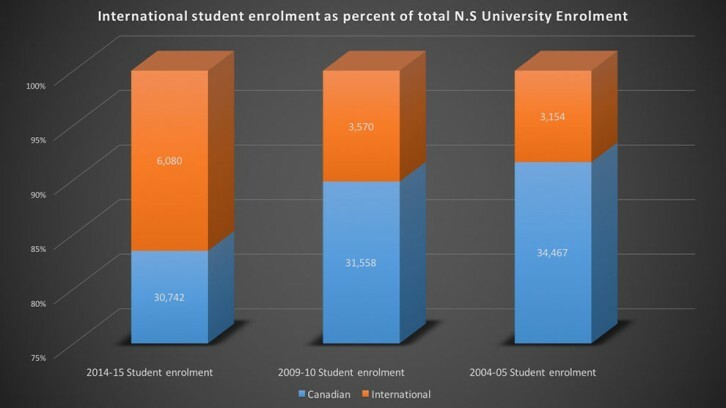 Over the last decade, the international student population in Nova Scotia has almost doubled, according to MPHEC. Meanwhile overall in enrolment is down. There are roughly 1,200 fewer students studying in Nova Scotia than there were 10 years ago. However there are 3,000 more international students. But education is a competitive market. Though it can be easy to compare our dollar to the American one, most international students don’t come from the States. According to the Canadian Bureau for International Education – another nonprofit that monitors international education in Canada – China, India, and the U.S make up half of Canada’s international student population. But students come from hundreds of different countries to study here. Some are oil producing nations that have also been hit by the markets. Here in Nova Scotia, that means cheaper tuition for some students, but more expensive travel for education marketers. Part of the institutional strategy to attract students to Nova Scotia schools is advertising the provinces’ value in other ways, including affordability and culture. Luther said EduNova lets students know about the low cost of rent and relative affordability of the Maritimes compared to larger centres like Toronto. In addition to hosting social events, the Dalhousie International Students Association helps students get set up with housing and banking before they arrive. “I’ve actually had people asking me if (the dollar) affects the price of items here, and it does affect the price of items here” said president Amr ElKhashab. ElKhashab says he hopes to stay in Halifax, but doesn’t think the Maritimes have as much value as their advertising campaigns portray. He points to downtown Montreal as an example. Even if rent is more expensive, it’s not a deal breaker for international students, he says. “If you’re going to shell out $10,000 for tuition every semester, you can shell out an extra $100 a month for rent,” ElKhashab said.